"We will remove your old seat & install the replacement for $40. Only takes a few minutes, nothing more to pay. All seats are white !" It's a relief to know these people are out there. Sometimes when I'm sitting on the toilet I think to myself "What if I ever wear this seat out? What on Earth would I do about that?" 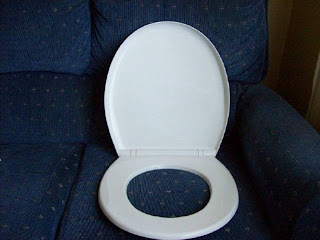 It's also a relief to note that my dilemma would be at an end with only one simple payment, because I admit I've worried from time to time about the hidden costs associated with buying a toilet seat.